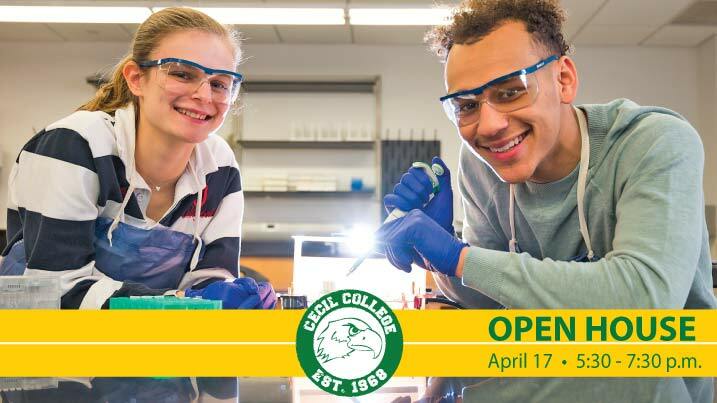 Join us for Spring Open House on Wednesday, April 17. The Opening Session will run from 5:30 – 6:00 p.m. in the Technology Center, Room 106 where you can learn about Admissions, Financial Aid, and Academic offerings available. From 6:00 p.m.-7:30 p.m., engage with faculty, staff, and current students in TC 208. Open House provides an opportunity for you to learn everything that Cecil College has to offer! Discover academic programs, inquire about our student support services, talk to athletics, and tour the North East Campus. You will also speak with Admissions staff, Financial Aid, scholarship representatives, Career Services, Advisors, Student Life, and much more. Plus, spin our Prize Wheel for some Cecil giveaways! See you there.